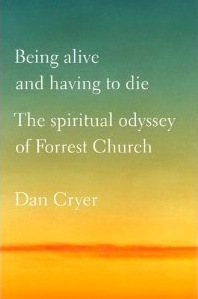 PRAISE for "Being Alive and Having to Die"
New York Times: "Inspirational ... Dan Cryer ably captures the theologian who was the son of a United States senator and became a champion of liberal political causes in religion." Tikkun: A "sensitive and insightful biography"
Cleveland Plain Dealer: "A fascinating portrait ... Cryer writes with grace and insight, and researches with care." Booklist: "A biography as winning and smart as its subject"
Kirkus: "A warts-and-all examination of a man ... masterfully told"
Boston Globe: "This book will appeal not only to Unitarians and religious seekers, but to anyone who cares about the role of faith in American life." Newsday: "Cryer's quietly moving biography affirms the enduring power of Church's liberal religious creed." UU World: "Eloquent ... a moving model for spiritual growth." BILL MOYERS on "Being Alive and Having to Die": "One of the most intriguing people I met as a journalist, Forrest Church ... thought long and hard about religion and politics, was at home in both spiritual and secular spheres, wrestled to live an ethical life but proved as flawed as any of us, and struggled to cope with the shadow of a famous and once powerful father. But I knew him only in passing ... Now, thanks to Dan Cryer's prodigious reporting, I understand more deeply the sources of his eloquence and the agony of his search. Even if you never heard of Church, you will find this man's pilgrimage worth your time." Dan Cryer was book critic at Newsday for 25 years. He championed the young Ethan Canin and Alice McDermott, caught out Norman Mailer and Don DeLillo when these emperors had no clothes, found lasting bounty in Alice Munro and Graham Swift. He interviewed Salman Rushdie when he was in hiding, Carol Shields as she lay dying, Mailer as he turned 80. Cryer has been a finalist for the Pulitzer Prize in criticism, a Pulitzer juror in general nonfiction, winner of the Page One Award of the New York Newspaper Guild and vice president of the National Book Critics Circle. His freelance book reviews have appeared in The New Republic, The Washington Post, Salon, Boston Globe, Chicago Tribune, Christian Science Monitor, San Francisco Chronicle, St. Petersburg Times, The Plain Dealer, UU World and other publications. He contributed to "The salon.com Reader’s Guide to Contemporary Authors" (Penguin), "Good Roots: Writers Reflect on Growing Up in Ohio" (Ohio University Press), "Conversations with William Kennedy" (University Press of Mississippi) and "Conversations with Louise Erdrich and Michael Dorris" (University Press of Mississippi). A graduate of The College of Wooster, Cryer earned a PhD in U.S. history at the University of Minnesota. The Ohio household that nurtured Dan Cryer was filled with books. His father, a Methodist minister, read widely in religion, history and biography, subjects which his son also came to love. Drawing on those interests, he has written "Being Alive and Having to Die: The Spiritual Odyssey of Forrest Church," a biography of Rev. Forrest Church, the foremost spokesman for Unitarian Universalism at the end of the 20th Century. The son of the late Senator Frank Church, the Idaho Democrat, Rev. Church was a prolific author and eloquent preacher and public intellectual. An anti-Jerry Falwell, he battled the cultural assumptions of the religious right in the conservative '80s and '90s, while counseling the religious left to pay attention to the status anxieties behind them. Church upheld the sanctity of the separation of church and state, challenged the right's monopoly on Bible, flag and family, and dismantled the lie that the United States is a Christian nation. Three years after being diagnosed with esophageal cancer that could not conquer his dignity and good humor, he died in September, 2009, at the age of 61. The biography is published by St. Martin's Press and edited by its editor-in-chief, George Witte. Buy "Being Alive and Having to Die"